Offering one of the few cafes in the area, the new Grass Valley Country Market, on Highway 97 in the center of town, fills a critical niche. It’s past lunch and still hours from dinner, but the Grass Valley Country Market is buzzing and busy. A table of travelers stop for a meal. Neighbors chat at the counter. A group of men take a break from work. A baby hangs from her mother’s hip. This scene is just what Alyson “Aly’” Sedlock and Nathan Little imagined when they transformed a tired old building into a small market and homey cafe. Grass Valley Country Market opened in June and has quickly become a community hub. “It’s so good to have a place to go with good food,” Marcy Richelderfer says. Born and raised in nearby Wasco, Marcy is one of nearly a dozen local folks who work at the newest business in Grass Valley. As the only restaurant for miles, the market fills a critical need. One side offers quick-stop-style groceries. The other side is a cafe that serves breakfast, lunch and dinner with counter service and table seating. Beer and wine are available, too. 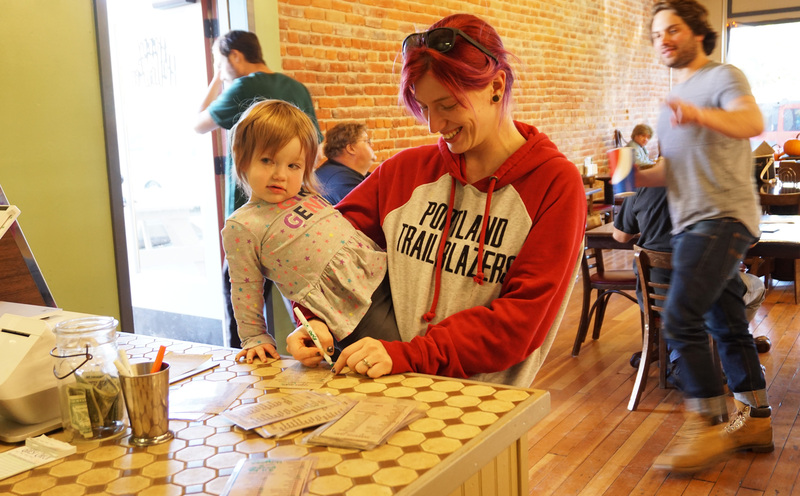 Offering the area’s only one-stop shop for groceries and meals, the Grass Valley Country Market fills a void and draws all ages, including Cheyenne Reeser and her child. “The area has been devoid of eating options,” says Chris Mansfield, who grew up in the area and now regularly visits her mother in Wasco. 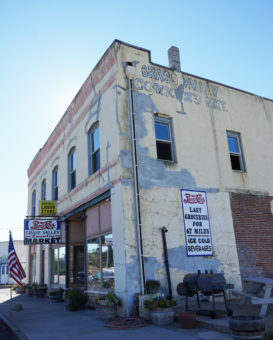 Dining choices have been limited to the Lean-To, located 9 miles north in Wasco, and the Moro Cafe, 9 miles further north. “There’s a lot of enthusiasm about seeing this new energy in Sherman County now,” Chris says. In the center of town on Highway 97 at Market Street, Grass Valley Country Market fills the first floor of a historic two-story building. A wall of windows allows natural light to shine along the cafe’s hardwood floors, high ceilings and exposed brick interior. 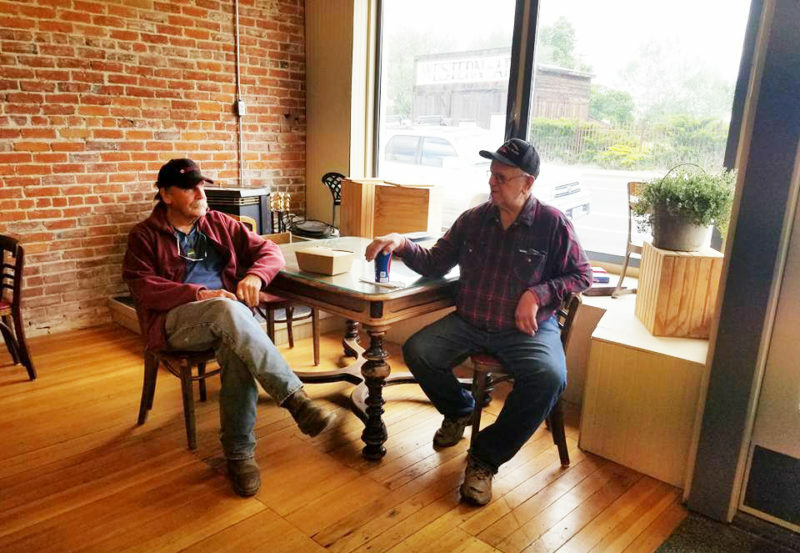 Gary Irzyk, left, and Gene Schilling enjoy coffee and conversation at the market. Built in 1904, the structure once served as a hospital to treat crews building the railroad. It was dangerous work. By 1910, the Des Chutes RR Hospital had treated 528 patients, with 18 deaths, according to the Sherman County Historical Society. The building later operated as a grocery and meat market. Until recently, the building had been shuttered for at least five years, according to Aly, who is happy to be part of the revival. “These buildings have life,” she says. The market draws a diverse crowd of truckers traveling along the highway, workers from the nearby hemp-processing plant, drivers from the race track, tourists and local ranchers, farmers and families. Steady customers—such as the two older men that come in for coffee every day—have helped shape the menu and prices. “I want it to be a gathering place, to be very accepting, a safe space for everybody,” Aly says. The lunch menu features burgers, salads and sandwiches, with vegetarian and vegan options. For dinner, served from 4:30 to 6:30 p.m., customers are offered one meal choice that changes nightly: pasta, tacos, surf, turf, pizza and chef’s choice. Prices run $10 to $15. Sunday brunch is served from 10 a.m. to 2 p.m. The market also hosts parties and caters local events. Raised in Salem, Aly attended college for a bit—short stints at Portland State and University of Oregon—before finding her niche at Le Cordon Bleu, a culinary school in Portland. Upon graduation, she worked all over the state, from Oregon City to Lake Oswego to Dufur. 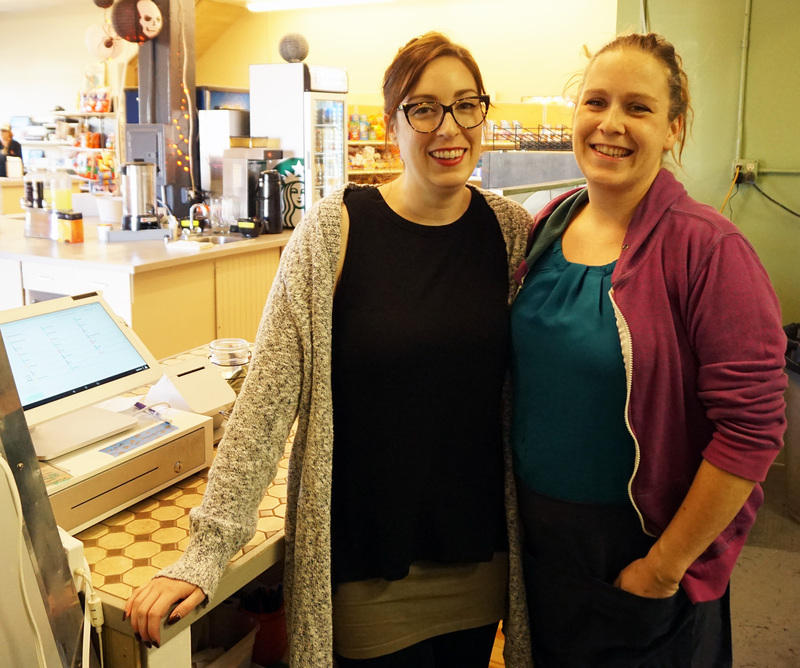 Sarah Sedlock, left, recently moved from Portland to Grass Valley to help her sister, Aly, with the new business. Aly can manage a busy lunch rush, cook up a juicy burger and fill a room for special events, but she cowers when the spotlight shines her way. She prefers to focus on the real heart of this place: the people. Aly and Nathan are dedicated entrepreneurs, doing it all and learning along the way: grocery, inventory, payroll, staffing. Though she grew up among gardens and animals, Aly is now learning about production farming, cattle ranching and the seasonal flux of a farming community. One thing Aly and Nathan have realized: Tuesdays are not slow. “Taco Tuesday is our busiest day!” Aly says. The Grass Valley Country Market is at 104 Mill St. Hours vary seasonally. Call (541) 993-8135 for more information, or visit Grass Valley Country Market on Facebook. © 2019 Wasco Electric Cooperative, All Rights Reserved | Website Design by Ruralite Services, Inc.